Wow...it has been a long time since I have posted. I apologize for that. I will try to do better. But, for the past several months, I have been busy working on another project. About a year ago, I was contacted by a couple of Christians in the Indianapolis area. They wanted my help in creating some Biblically-accurate videos about the life of Jesus. Of course, I jumped at the opportunity. Last June, six of us traveled to Israel and recorded the video for the first five episodes of a series entitled "Following the Messiah". These episodes cover Jesus' life from His birth to the selection of his apostles. After many months of hard work, the videos were officially released on Saturday. To celebrate the occasion, we had a public showing of two of the episodes at a wonderful theatre in Indianapolis. I encourage you to view the videos. As I said, they were shot on location in Israel. They can be used in Bible classes, family devotionals, or any number of ways. They are all about 25 minutes in length are free to download. They can be accessed via the Appian Media website. Please watch the videos and give us feedback! We would love to know what you think and what else you would be interested in seeing. I have been lucky enough to travel to Israel several times. But last June, when I was traveling with the team from Appian Media, I was able to see something that I have never seen before. While we were staying in Tiberias, it was clear enough so that I could see Mount Hermon from the lake. The picture at the top of this post was one (of many) that I captured. Most of the time, there is too much haze in the Hula Valley to see the mountain from this distance. The above picture was taken late one afternoon. You can clearly see Mount Hermon and the location where the Hula Valley (with the Jordan River at its base) empties into the Sea of Galilee. Mount Hermon sits about 60 miles north of the Sea of Galilee on the modern-day borders of Israel, Syria and Lebanon. It rises over 9,000 feet in elevation. Since the Sea of Galilee sits approximately 700 feet below sea level, the top of the mountain is nearly 10,000 feet above the location of this photograph. The Old Testament city of Dan and the New Testament city of Caesarea Philippi sit near the base of the mountain. In the 4th century, Bishop Cyril of Jerusalem suggested that since many of the activities in the lifetime of Jesus happened around Mount Tabor, therefore he preferred that site as the probable location of the Transfiguration. Consequently, that site has been recognized as the traditional location of the event since that time. However, many recent scholars prefer the location of Mount Hermon for the Transfiguration. Just prior to the Transfiguration, Jesus and His disciples were at Caesarea Philippi. This is told to us in Matthew 16:13, when Jesus discusses who they believe He is. Peter responds by saying that "Jesus is the Christ, the son of the living God." Then, six days later (Matthew 17:1), Jesus took Peter, James, and John onto a "high mountain". While it would have been possible to travel from Caesarea Philippi to Mount Tabor (a distance of about 70 miles) in six days, it seems more logical that the "high mountain" that was mentioned in Matthew is referring to Mount Hermon, especially since they were already in the area. I agree with this assessment. NOTE: This is the final article in a series of posts as we have looked at places where Jesus walked. If you would like to go back and look and some of the previous posts, they covered the Southern Steps of the Temple Mount, the shore of the Sea of Galilee, a Roman Road in Galilee, the hills of Samaria, and on the Sea of Galilee. This verse comes toward the end of Jesus' life here on earth. After visiting the city of Jericho, Luke tells us that Jesus left the city and went up to Jerusalem. The picture at the top of this post is of the hills west of the city of Jericho. A road known as the Ascent of Adummim goes up these hills. As the crow flies, the distance between Jericho and Jerusalem is about 12 miles. However, over that 12 miles, there is an elevation gain of about 3500 feet. The road is desolate, barren, and travelers are totally exposed to the sun. I have hiked a good bit in the Smoky Mountains. One of the things that you quickly learn while hiking is that it is very difficult to talk and walk at the same time. You need to use as much energy as you can to keep walking. So, you end up doing a lot of thinking. 1) How hot and dry it was. It would not have been an easy walk. 2) The week that was ahead of him. He knew what He was going to have to go through. 3) He was probably thinking about you...and me. He knew that if He did not walk up that road and go through the trials of the next week, we would have no hope. So, what lesson can we learn from Jesus walking up this road? We can learn that we need to be willing to make sacrifices for others. What Jesus did for all of us is the single, most important sacrifice that has ever been made. Do you want to walk like Jesus? Then walk up the Ascent to Adummim and be willing to make true sacrifices for others. How would you like to travel with me to Israel and see many of these places that I have mentioned? I am leading a tour next June and I would love to have you join me. For more information, see my website. Do not let this opportunity pass you by! NOTE: This is the fifth in a series of posts about Walking Like Jesus. The previous posts were about the southern steps of the Temple Mount, the shore of the Sea of Galilee, a Roman road to Capernaum, and the hills of Samaria. The picture at the top of this post is of the sun rising over the Sea of Galilee. I know what you are thinking. You are thinking, "Barry is going to tell me to go walk on water!" No, not really. But, I do want us to consider what lesson we can learn from what Jesus did here. The lesson we can learn is this: We need to try the impossible. Satan has many weapons in his arsenal. One of his most powerful lessons is doubt. How often have you said, "I can't do that!" As soldiers of the cross, we should be willing to do whatever we needed to do to tell others about Jesus. Perhaps you do not think that you could ever teach a Bible class. Give it a try! Perhaps you do not think that you lead a prayer in public. Give it a try! Perhaps you do not think that you would know what to say to someone who is struggling. Give it a try! You may think that those things are impossible. But, you never know, you might find out that they are really possible. And, not only that, you might actually find that you are good at them. Consequently, people will learn more about Jesus. Do you want to walk like Jesus? Then do the impossible and try to walk on the Sea of Galilee. In doing so, you might find that the things you thought were impossible are actually possible. The picture at the top of the post is of the northern shore of the Sea of Galilee. What lesson can we learn from Jesus at this location? We can learn that we should look for potential in others. Fishing is a noble profession. Every time I pick up some fish from the meat market, I am glad that there are professional fisherman in this world. As Jesus walked along the shore of the Sea of Galilee and saw these four men, he recognized the potential in them. Even though they had a wonderful profession, there was even more that they could do. It is not enough, however, to just recognize the potential. Jesus also had to reach out to them and encourage them to do the work that He had for them to do. How do you look at others? When you look at others, do you look for potential in them? I believe that everyone has the potential to help spread God's Word. Maybe everyone is not a public speaker. That is okay. There are plenty of other jobs that need to be done. Maybe we need to be looking for people that can say a comforting word to someone who needs it. So, look for potential in others to help spread God's Word. Then, just like Jesus did, ask them to get involved. If you do this, you will be walking like Jesus. A few years ago, my family made a trip to the Explorations in Antiquity Center in LaGrange, Georgia. Having grown up studying our Bible and learning all of the lessons contained therein, we found the center very interesting. The items that they had on display gave more context to the Bible. Since that trip, I have had the opportunity to travel to Israel five times. Consequently, I appreciate even more what they are trying to do at this wonderful museum, now renamed to the Biblical History Center (BHC). BHC has a number of options of things to do and see. Among them are: 1) Garden Tour - In the garden, they have a number of reconstructed items from the land of Israel like a wine press, olive press, alters, grave stones, houses, wells, etc. 2) Shepherd's Bread - Be invited into a tent and make bread and butter from the simple ingredients that you have in the ancient times. 3) Kid's Archaeological Dig - Kids can dig in archaeological squares and find items of interest. 4) Biblical Meal - Recline at the table and eat many foods found in the Bible. 5) Biblical Life Artifacts Gallery - BHC is one of only six places in the world in which the Israel Antiquities Authority (IAA) allows some of its contents to be displayed. BHC has a very impressive collection. About three months ago, I was approached by a couple at the congregation where I attend about organizing a trip to the Biblical History Center. We began making inquiries with other members of our congregation and before we knew it, we had over 60 people interested in going. We collected money from everyone, rented a tour bus and obtained our tickets. 1) The night before we left, my friend Ferrell Jenkins posted a long blog post about the BHC. As far as I know, he had no knowledge our group's intention on traveling there the next day. He provides some great information about the history of BHC. 2) BHC was founded by Dr. James (Jim) Fleming, who is well known for his teaching and writings of the land of Israel. As many of my readers know, I have been in Israel this month working with Appian Media. We were there to film some videos that can be used in teaching others about Jesus. While we were visiting Caesarea Philippi, we decided to travel a couple of miles to the west and visit Tel Dan. As we were walking through the tel, we crossed paths with a gentleman and his group of about 20 people. That gentleman was Jim Fleming. He was spotted by my friend and Israeli guide, Gus. Years ago, Gus was enrolled in one of Dr. Fleming's classes at Hebrew University in Jerusalem. Jim was very kind as we all exchanged greetings before going on our way. If you know me, you know that I am always trying to encourage Bible students to travel to Israel to learn more about the Bible. However, I know that it is not possible or many people. If you live in the southeastern United States, I encourage you to take a day and visit the Biblical History Center. You won't be disappointed. Appian Media - I have started working part-time with a small company that is traveling to Israel this week! We will be making some videos that will follow the life of Jesus. 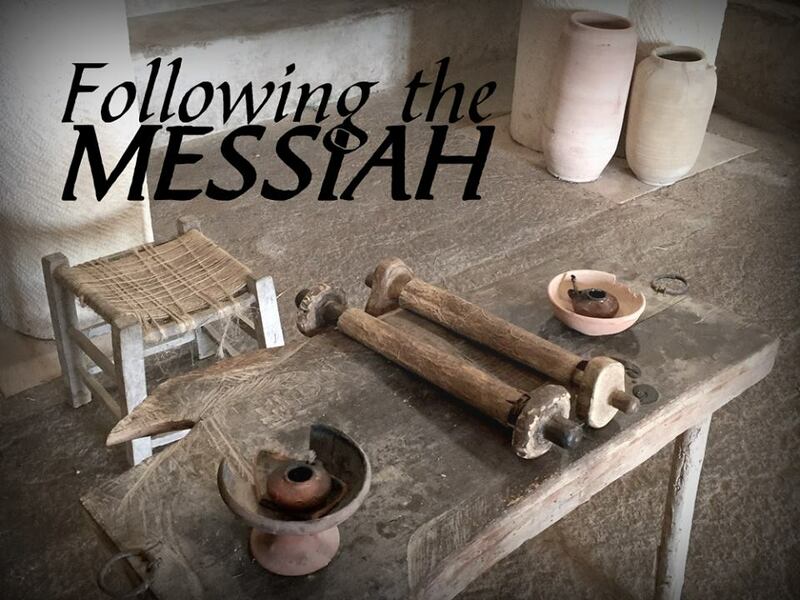 The first five videos will feature Jesus' birth, His temptations, and His early ministry. You can read all about what we are doing on the Appian Media website. In addition, you will be able to keep up with all of our efforts on the trip on the site as well. Upcoming Tour of Israel - I am excited to officially announce my next tour of Israel. It will be June 5-16, 2017. There have been a number of people ask me about it, so I am pleased to share that information with you. You can read details about the tour on my website. From that page, you will be able to download a registration form and view frequently asked questions. If you have any questions, please feel free to contact me. Satellite Bible Atlas Videos - Todd Bolen and Ferrell Jenkins have mentioned on their websites about the new videos from Bill Schlegel and the Satellite Bible Atlas. These videos (and the atlas that goes with them) are a great source of information. I highly recommend watching them. A couple of months ago, I was contacted by a couple of Christians living in Indianapolis, Indiana. They are both video producers and had spent a great deal of time looking for Biblically-based videos to be used in their classrooms for teaching. While there are a number of videos available, none of them fit their need exactly, or were not as Biblically accurate as desired. Tired of looking, they made the decision to make a series of videos themselves. They contacted me to learn more about traveling to Israel. After a number of email and phone conversations, they asked me to join their team and assist them with the logistics of the trip and helping to arrange the locations to go. I could not be more thrilled. The plan is to produce five 20-minute videos covering the early life of Jesus. We will visit Nazareth, Bethlehem, Jerusalem and the Galilee. Our goal is to make this trip during the month of June. When we are completely finished, we will set up a website and allow everyone to download the videos for free. The four of us on the team have agreed to use our vacation time from work to make this happen. Earlier today, we started a Kickstarter Campaign to raise the funds in order to do this. To this end, I would like to ask a couple of favors from everyone. First, go and like our Facebook page. That is the easiest way to keep up with what we are doing. Second, pray for the success of our efforts. Our goal is that we can produce these videos in such a way that they will be useful in spreading the Gospel and teaching others about Jesus. We need your prayers to help us do this. Third, please spread the word about this campaign. The more people that know about it, the better chance we have at success. With Kickstarter, it is an "all or nothing" campaign. So, if we do not raise the full amount, the videos will not be made. Finally, if you are inclined, we would appreciate your financial support. Go to the Kickstarter page, watch the video and look at the different levels of support. Regardless of the level you choose, you will be able to view and download the videos two weeks before they are formally released to the public. Higher tier donations will be able to request that members of the team come to your congregation to talk to your group about the videos and how they can be used in teaching. Thank you in advance for your time and consideration. If you have any questions, please feel free to email me and I will be happy to answer them. Why did the disciples not believe Jesus? Probably because what Jesus said just did not make sense to them. They could not imagine a scenario in which these “wonderful stones and buildings” could be destroyed. They also did not truly believe in the promises of God. A Quick Tour During the period of the United Kingdom, Solomon expanded the city of Jerusalem to the north and built a beautiful temple on the top of the Eastern Hill. It was constructed with lumber from Lebanon and precious metals from other places in the world. It was the pride and joy of the Israelite nation. This temple was used (and misused) by the people for hundreds of years. Then, in 586BC, the Babylonians captured the city of Jerusalem and destroyed the temple. After the captivity ended, under the direction of brave men of God, the temple was rebuilt, but not to the former glory it once had. When the Romans captured the land in the first century BC, King Herod started massive building projects across the land. In an attempt to appease the Jewish people, King Herod decided to enlarge the temple complex in Jerusalem. He chiseled away at the bedrock on the northern part of the Eastern Hill and used that rubble to fill in the area around the southern part of the hill. He then constructed a massive retaining wall around the entire area. The end result was a 36-acre raised platform containing an enlarged and renovated temple complex on the top. At that time, it was one of the largest building projects in the world. The Temple Mount was the centerpiece in the Roman-renovated city of Jerusalem. From anywhere in the city, the temple could be seen. And, within the city, all roads led toward the temple. It is no wonder why the disciples of Jesus were impressed (and perhaps even proud) of what they had in their own city. 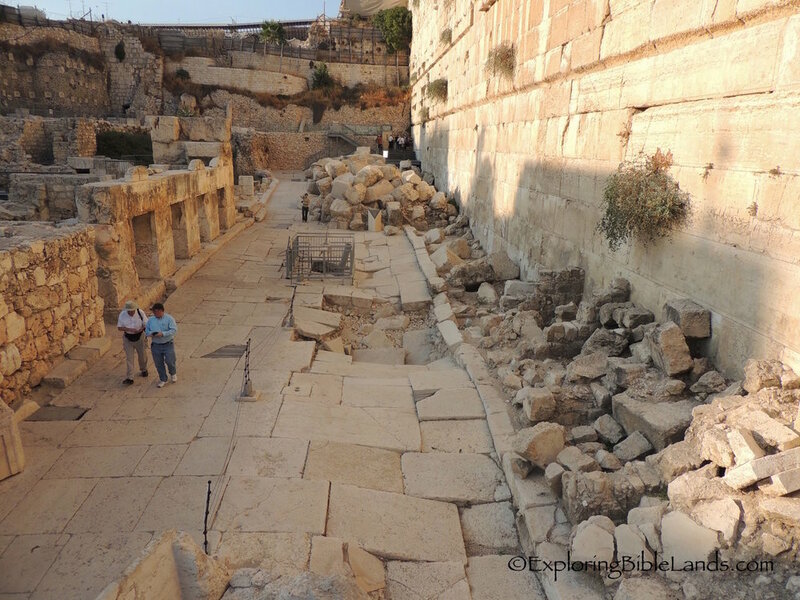 After the destruction of Jerusalem in 70AD, many parts of the city were buried in rubble and debris. Centuries of wind, rain and dust contributed to the burial process until there was almost no visible evidence of the destruction remaining. In 1967, after Israel captured a portion of Jerusalem, archaeologists were able to begin the work of digging around the Temple Mount. Adjacent to the southwest corner, they found a first century Roman road. The pavement stones were almost entirely intact as they had been buried for centuries and protected. Along with this Roman road, there were also found shops, houses and mikvahs. However, what interested Bible scholars was not necessarily the road itself, but what was found on the road. Scattered and piled along the road were huge hewn cut pieces of stone. Stones that obviously were used in the construction of something. The road area underneath these stones had been damaged by the stones as they were dropped upon them. These stones were from the Temple Mount platform area. They were either from part of the retaining walls or one of the other structures built on top. As the Romans destroyed the city and burned the temple, these stones were thrown down onto the road below. Just like Jesus said would happen. Lesson: God’s promises always come true. Throughout history, God has made promises. In fact, the first recorded words of God to Adam and Eve was a command, followed by a promise. Later, after man disobeyed God’s command, He offers all of mankind hope in another promise to the serpent, Eve and Adam. Of course, all of these promises came true. In our lifetime, we meet thousands of people. Consequently, we will have many promises made to us. Some of these promises are ones with small consequences (“I’ll make my bed later this morning”, or “I’ll take the trash out before it rains”). But others have much larger consequences (“I promise to love, honor and obey you, until death do us part”, or “I promise to raise you up as a child of God.”). If we surround ourselves with good people, very often these promises are kept. But sometimes, through no fault of our own, people break the promises that they made to us. In these times, we feel disappointed, sad and rejected. It is easy to think that the promise was broken because something came about that was deemed to be more important than yourself. Luckily, we have a God that is loving, patient and true. He promised Noah salvation from the flood. He promised Abraham a large family and a land. And He promised the prophets of the impending destruction of the nation. All of those promises came true. God has made promises to all of us. And as we have discussed, God’s promises always come true. If we forget, all we need to do is to remember this Roman road in Jerusalem. Jerusalem The Movie Trailer Details of Jerusalem The Movie Trailer I Finally Saw Jerusalem The Movie I Finally Saw Jerusalem The Movie (At Home)! Now, I am glad to say that the movie is available for rental or purchase via iTunes, Amazon Prime, Google Play, etc. Last night, my family rented it and watched it again. Of course, it is not as impressive as watching it on the huge IMAX screen, but enjoyable nonetheless. I encourage you to watch it and learn a little bit about this amazing city. In 2010, I made my first tour to the country of Israel. As a Bible student and as one who loves geography, this tour helped me to better understand many parts of the Bible. Until this tour, I understood WHAT the writers were saying, but in many ways I didn't understand WHY they said it the way that they did. The tour caused me to go back and restudy many passages that I had taken for granted. That tour was one led by Ferrell Jenkins. Mr. Jenkins has been leading tours to Israel since 1967. (For those of you who are familiar with history, his first tour was just a couple of weeks before the Six-Days War.) Soon after this tour, I decided that I wanted to try to lead tours to Israel as well. I spoke with Ferrell many times about it. He offered me guidance and patiently answered all of my tedious questions. I returned to Israel with him in 2012 to learn more about the land as well as leading tours. Since that time, I have successfully led two tours in June 2014 and October 2015. There is an unspoken thrill in helping people to understand the geography of the Bible and watching it all "click" in their minds. Next year, Mr. Jenkins will be leading another tour in which he will be celebrating 50 years of leading tours. If you have ever had an interest in going, I encourage you to contact him and let him know of your interest. Recently, he published a short article answering many questions that he (and others that lead tours over there) receive concerning the safety of travel in Israel. In that article, he references myself and my recent tour. To that end, I wanted to lend my words in confirmation of what he states in the article. My most recent tour was last month. If you paid any attention during that time, there were items in the news concerning physical confrontations between the Palestinians and the Israelis. Many of these confrontations resulted in injuries and deaths. Sadly, these reports are true. But, they were very isolated and failed to tell the complete story. One morning that we were in Jerusalem, I was watching FOXNews and there was a headline on the bottom of the screen stating "Israel in Chaos". I immediately turned and looked out my window. I could see cars on the streets, people riding bikes to work and children (with their Superman and Barbie backpacks) walking to school. The situation on the ground was nothing like what was being portrayed on the television. While there were problems, this was limited to an extremely small minority of the population. While we were over there, we never saw any problems. We were greeted by warm, loving people who were glad to see us and welcomed us with open arms. Each day, my tour group rested comfortably in the hotels, ate delicious food in the restaurants and visited dozens of Biblical sites. We shopped in the Old City. We spoke with the shop owners. And we experienced the culture of the people. On nearly every day, someone from my tour group mentioned to me how safe they felt in Israel. Since we have returned, many have privately mentioned to me that "they never had a single concern as we traveled". Our world is a world who does not look to God. For the most part, the people of this world seek their own self interests over the interest of God. When that happens, bad things occur. They always have and they always will. Occasionally, bad things happen in Israel. I will not deny that. But, you know what? Bad things happen in your hometown as well. Do you need proof? Watch your local news tonight. I don't care where you live, within the first ten minutes of the news, you will hear a story of someone being assaulted or perhaps even killed. It is sad, but it is true. Yet, without thinking about it, you will head into your local hometown where those bad things happened. Do not let your perception of the situation in Israel keep you from enjoying the thrill of a lifetime and growing as a student of the Bible. Next spring, Ferrell Jenkins will lead a tour to Israel. If you are a student of the Bible, I encourage you to consider going and celebrate 50 years of touring with him. You will be able to watch the sun rise over the Sea of Galilee. You will see the Valley of Elah where David defeated Goliath. And you will be able to stand on the Mount of Olives and look over Jerusalem. It is a great opportunity. Don't miss it. One of the most interesting parts of the land of Israel is a part of the land that we rarely study. That area is called the Shephelah. In our English Bibles, this is usually translated as "lowlands". It is a small area of land between the Coastal Plain and the Central Mountain Range. During. The period of the United And Divided Kingdom, this area played a major role in many of the Biblical stories. 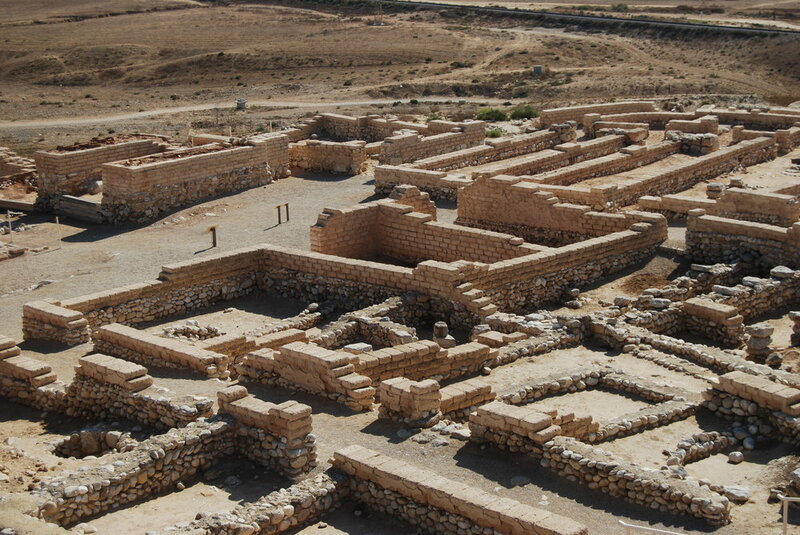 Our first stop was at he Sorek Valley, commonly known as the stomping grounds of Samson. From the tel at Bet-Shemesh, you can see Zoar (where Samson grew up), Timnah (where Samson went to find a wife) and the overall valley (where Samson burned the fields find a wife) and the overall valley (where Samson burned the fields by using a number of foxes). About a ten minute drive away is the Valley of Elah, the site of the famous battle between David and Goliath. By standing in this valley, and reading the passage, this story takes on a very personal and richer meaning. After making a brief stop at Lachish, we made our way down to Beer-Sheva, the home of Abraham, Isaac and Jacob. From the top of the tel, you make the transition to the Negev. It was a wonderful day and we look forward to more adventures tomorrow.